I just wanted to share this wonderful article about Mexico City with you all. My sister Jess sent it to me. I know that what you may hear in the news about Mexico can be frightening. So, here is a very positive take on the city that I have come to love. Enjoy! I now have been in Mexico for two months. The time is going by quickly. October just flew by. I am developing great relationships and learning new things everyday. My relationship with Bishop Carlos is really blossoming. Through our work together I am learning so much about the Anglican Communion, Mexican culture, and how we are all connected. Every conversation with him no matter how big or small something new is revealed to me. I am growing in so many ways. I of course have my growing-pains but that is to be expected; I take it all in stride. I went to the downtown Cathedral on the 24th of October. It was amazing to be in this 400 year old church. 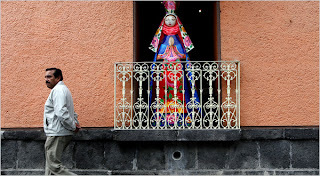 It was originally a Roman Catholic Church in the 1600's and then the Mexican Government gave it to the Anglicans in 1869. It is the oldest Anglican Church in the Americas. I could feel the history that had happened in-between those walls the minute I stepped in. It was a wonderful experience. I look forward to November. Thank you all for your prayers and good thoughts; I am so grateful. Please know that with each step I take and smile I make you all are a part of my time here. Many Blessings! How do I put into words my first week here in Mexico City or the D.F. (Distrito Federal) as locals call it? How can I put into words the color of the sky, warmth of people’s smiles, smells and tastes of some of the most incredible food, and the vitality of one of the world's largest cities? Those are just a few of the questions that I will try to explore and begin to answer over the next year. I was welcomed in the Benito Juarez Airport by two of the clergy here in this diocese: Madre Sally and Padre Javier. Their smiles and “Bienvienda/Welcome” to Mexico were just what I needed after my long day of traveling and even longer night of packing. I met with El Obispo (Bishop) Carlos that afternoon... and had a great conversation about the year ahead of us. He is a wonderful and warm person. I am living on a compound that holds a seminary, both the national and the local diocesan offices, The Bishop’s house, and many other living accommodations, as well as a beautiful garden. I live in third story apartment with all that I could ask for and more. I am very blessed. I live in a borough of the city called, San Angel. It is a more residential area of the city. San Angel is very beautiful and very urban. However, I am surprised to see how many trees are here; the various shades of green are beautiful. All the colors of this city are incredible! The vitality of this city is palpable. I am in walking distance to everything I could need and more. I look forward to all the exploring I will do over my year. Over my first weekend I went to two amazing communities. On Saturday I went to San Mateo in Teculco with Madre Sally. 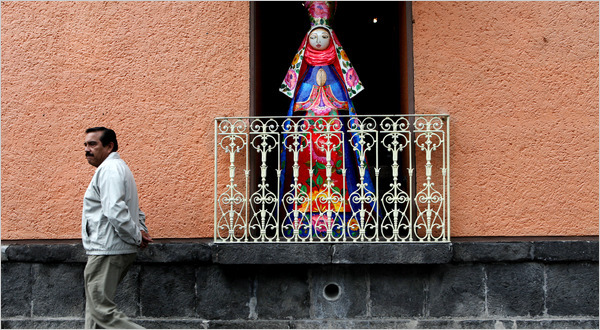 Teculco is an hour and half outside of the city near the Popocatepetl Volcano. We had a BBQ at Los Palomas (Park near the Volcano) with some of the youth and families of this community. I ate some of the most incredible tacos I have ever had. I had a wonderful time! On Sunday, I went to Santa Cruz Iglesia (Holy Cross Church) with Obispo Carlos. The priest there is Padre (Father) Javier; who welcomed me at the airport. His parish is a growing mission in the diocese. The church had to be carved out of volcanic rock. It has one of the most beautiful altars I have ever seen. After church we had one of the most incredible meals I have ever had. We ate tamales de frijoles y mole (mole and beans) pollo y mole (chicken with mole), papas con chorizo (potatos with a spicy sausage), chicharron y salsa verde (pork in green salsa) and rajas con crema (sliced peppers stewed in cream). Mole for those who don’t know is a sauce made from an average of 20 to 30 ingredients. There are different Moles from different regions of Mexico. Some mole ingredients include walnuts, peanuts, pine nuts, sesame seeds, pumpkin and/or squash seeds, cilantro, seedless grapes, plantains, garlic, onion, cinnamon, chocolate and more. The food was absolutely delicious! I enjoyed every moment and morsel of that Sunday. I am extremely blessed to be with these wonderful people and in this amazing city. I look forward to sharing the year ahead with you. Thank you for keeping me in your thoughts and prayers; I truly feel lifted up by them. All the best! As a member of the Young Adult Service Corps (YASC), I will be living in Mexico City for a year working with the Presiding Bishop, The Most Reverend Carlos Touché-Porter. Please follow this blog to stay updated!